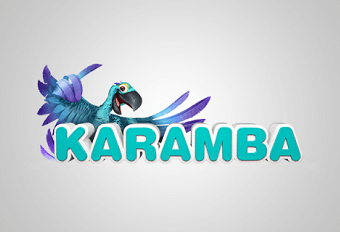 Adorned with their cheeky, blue parrot mascot, Karamba Casino is a site dedicated to casino games and scratchcards. It was founded in 2005 and is registered in Malta, operated by Aspire Global International Limited and regulated by the Malta Gaming Authority. In the UK it is operated by AG Communications and regulated by the UK Gambling Commission. As the sole product is casino games, the site is easy to navigate without Sport and Bingo tabs to crowd the screen. Instead, all you have in front of you are your casino favourites from the best classics to new games. You’ll be sure to find something perfect to play in just a few clicks. Just like their homepage, this Karamba Casino Review aims to point you to the information you are looking for about this interesting online casino. Finding the game you want on Karamba Casino couldn’t be easier with interactive menu bars split into categories such as Featured Games and New so users can access the best content as quickly as possible. There is also a Recent Games tab so you can find your own personal favourites with ease. Like many online casinos, slots are the main feature of Karamba Casino. They are split into Video Slots and Classic categories which essentially means choosing between a 5-reel slot with many bonus features or 3-reel slots based on traditional fruit machines depending on your style of gambling. There are a good number of Karamba Casino exclusives in their selection of over 150 slots including Fu Er Dai, Mighty Sphinx and Scruffy Duck. Even among the exclusives alone you’ll find variety between beautiful artistry, cute cartoons and exciting 3-D graphics. Karamba Casino has one of the widest selections of virtual scratchcards in the online casino market. This often-neglected type of gaming is given a chance to flourish and Keno enthusiasts have lots of options. Some of the games such as X&O go beyond the simple, fixed odds format and provide new twists keeping the game fresh and exciting. There are some card and table games, including a live casino available in the Casino Games section. Versions of Roulette, Blackjack and Baccarat are available for every level and every pocket. All games (except live casino games) are available to play in demo mode so you can familiarise yourself with a slots paytable, learn the rules of an unfamiliar casino game or just tide yourself over until your next deposit with no risk. Karamba call their blog Casino Magazine and they pack it full of articles on the latest online casino updates and ways to improve your gambling. You can get tips on risk management, exploiting vulnerable games and building your gambling strategy. Aside from general gambling advice, there are also articles on specific games such as Roulette, Blackjack, slots and Scratchcards. While there are a few other betting sites who offer rules and advice for getting the most out of their games, Karamba Casino’s magazine layout, with great illustrations and easy browsing, makes for a smooth and pleasurable reading experience. There are big names providing the games for Karamba such as Microgaming, NetEnt, Neogames and Quickspin. They are audited by third party iTech Labs to ensure a fair and random game. This instant play site requires no downloading to play on your desktop. There is also a mobile casino that can be accessed via the browser on your device after receiving a link by email invite. Karamba Casino offers a wide range of promotions to suit every type of gamer visiting their site. Their Welcome Bonus promises to double your first deposit up to £200 plus 100 free spins. After you’ve put down your first deposit and claimed your Welcome Bonus you are automatically enrolled into their Loyalty Scheme where you earn bonus points just for playing. It is then just a matter of climbing the VIP ladder to unlock rewards and gain access to exclusive offers. Open to Platinum VIPs and above is the monthly cashback scheme which pays you back based on your losses. There are always one-off promotions happening at Karamba Casino including seasonal specials, competitions and prize giveaways. Prizes are often bonuses, free spins and cash prizes up to £100,000. As with all online casinos, promotions and deposit bonuses are subject to terms and conditions so be sure to read all the fine print before participating to get the full benefit of playing. By knowing the limitations and wagering requirements prior to playing you won’t be hit with any surprises in the future. As well as by card or by wire transfer, there are a number of e-wallet payment methods for depositing with Karamba Casino including ClickandBuy, Entropay, EcoPayz, NETELLER, Skrill, Hipay, Trustly and Paysafe. Karamba Casino are very easy to contact with their blue parrot holding out a phone receiver to you on every page, inviting you to live chat. The customer support team are also available by email and their opening hours are 6:00 to 23:00. Their motto is ‘CARE’ which stands for Customers Are Really Everything further showing their commitment to their users’ experience with the site. Karamba take Responsible Gaming seriously. There are a range of tools for when the games become a bit too much such as reality checks which notify you every hour you game and self-exclusion options to limit playing. There is also information about spotting the signs of gambling addiction and links to organisations and charities that can provide support.